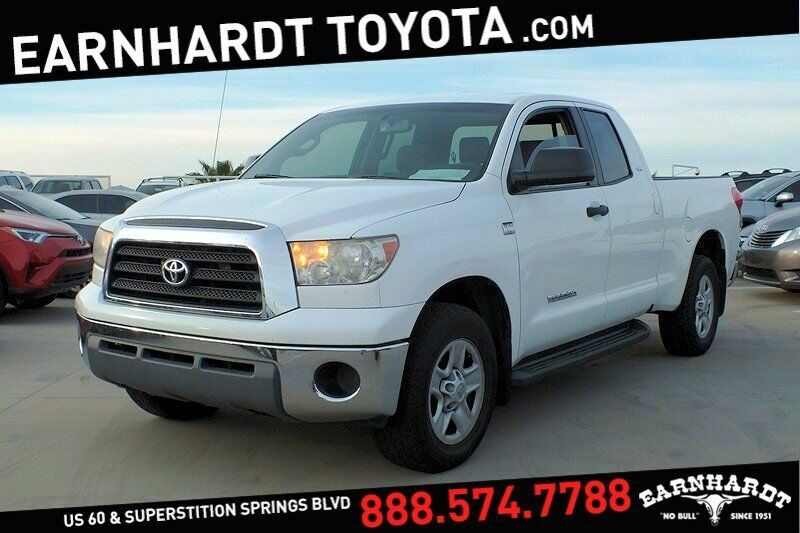 We are happy to offer you this 2007 Toyota Tundra 4x2 Double Cab SR5 which was recently traded in to our dealership. This has been owned in Washington and Arizona since new and is a reliable daily driver you're going to be impressed with! This has 18" factory wheels and the tires have good tread on them. The Super White exterior shows well with no crucial damages or flaws. The Sand Beige upholstery is in good condition with no extensive wear or tears present. This has been well maintained and currently has 162k miles, please come in for your test drive today! Features include running boards, power windows, tilt wheel, cruise control, AM/FM/CD player, cup holders, console, power seat, daytime running lights, ABS, stability control, traction control, dual airbags and more. Why should you buy from Earnhardt Toyota? 1. We are a family owned and operated business for over 60 years! 2. We are at the top in customer satisfaction for 4 years running! 3. We have award winning sales, service and parts departments! 4. We have received Toyota's top honor, the President's Award, 4 years in a row! 5. We offer a friendly, no pressure atmosphere! 6. For every vehicle we sell, we donate to the Mesa Child Crisis Center.